Having thrown my hands up at the 'to do' lists around me, and with a slight feverish haze, I rebelled against myself last night by making a skirt. Totally unnecessary on one level, and completely integral to my sanity on another - you know how that goes. I've had this skirt on the brain since seeing it in the Garnet Hill catalog, and so this is the version I came up with - using one of my favorite color combos at the moment. I am so pleased that it worked out (ie. it fits), as I never do know what will happen when I start measuring and cutting without much of a plan. It often ends up back in the pile of fabric to be cut up again, rather than actually on me. This was just the kind of minor success I needed this week. Remember these? I didn't intend to make a matching holiday outfit this year. Really, I didn't. 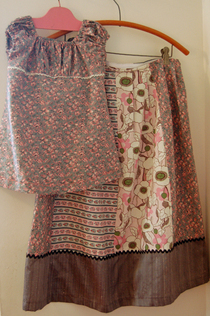 But once I finished my skirt, I had a vague memory of using one of the fabrics before on a dress for Adelaide. I dug around the unfinished work pile (mountain) and found this dress, which I now remember abandoning when I realized it was too big. Now it fits, and even though it's summery, it will be just perfect for a party at my grandmothers house, where the heat is never below 90 degrees (ack!). I still can't believe I'm someone who makes coordinating clothes for my family. I swore I would never do that, didn't I? And here I am. And I love it. With this set not being the first, and matching holiday pajamas for the babes up next on the work table. Oh my. I guess I'm embracing my inner matchy-ness.